Hello and welcome to our live coverage of stage 5 of the Vuelta a San Juan. Today's queen stage runs 169.5km from San Martín to the summit finish of Alto Colorado. Today's stage looks to be decisive day of the race, with the long climb of Alto Colorado capping things off. Julian Alaphilippe (Deceuninck-Quick Step) carries an eight-second lead into the stage, with Fernando Gaviria (UAE Team Emirates) lying in second overall. It's obviously extremely unlikely that the Colombian sprinter will be in contention today though. Instead, expect challenges to come from Valerio Conti (UAE Team Emirates) at 22 seconds back, Felix Großschartner (Bora-Hansgrohe) at 26 seconds, and Nairo Quintana (Movistar) at 48 seconds. The best-placed riders from the South American Continental teams are three-time race winner Laureano Rosas (Asociacion Civil Mardan), who lies 40 seconds back on Alaphilippe, and 42-year-old Óscar Sevilla (Medellin), a further second down. We're just a few minutes away from the stage start. Here's a quick reminder of the top 11 on GC. The race has started and a few riders have already clipped off the front. It looks like nine riders have broken away from the peloton. No word as to who just yet. More are attempting to break away too, as a crash in the middle of the peloton slows up the chase. Several riders are involved, including two from Deceuninck-Quick Step, a Chilean national team rider, Tom Bohli (UAE Team Emirates) and a rider from Israel Cycling Academy. Alaphilippe and Hodeg were the two Quick Step men caught up in the crash. They're back underway now, though. Here's the makeup of the breakaway: Matúš Štoček, Ottavio Dotti (both Team Beltrami Tsa - Hopplà - Petroli Firenze), Nelson Soto (Caja Rural - Seguros RGA), Maximiliano Navarrete, Victor Arroyo (both Argentina), Gerardo Tivani, Héctor Lucero (both Municipalidad de Pocito), and Adrián Richeze (Agrupacion Virgen De Fatima). Another group of six riders is chasing the lead breakaway. The chasing group has a rider from Nippo Vini Fantini Faizanè, one from Medellin, and two from Asociacion Civil Mardan. We don't know who they are yet, nor the other two riders with them. Cristian Montoya (Medellin), Facundo Cattapán (Municipalidad de Rawson Somos Todos) and Orlando Garibay (Mexico) are both in the chase group. Still no word on the rest of the group, though, or the time gaps between them all. Damiano Cima (Nippo Vini Fantini Faizanè), Giovanni Pedretti (Biesse Carrera) and Kevin Castro (Municipalidad de Rawson Somos Todos) are the other three riders in the chase group. The peloton is five minutes behind the lead breakaway group at the moment. We're coming up to the first sprint of the day, after 30km. Navarrete beats Soto to the line, with Richeze taking third. We're now around 30km from the first climb of the day, the third category Alto de Villicum. They're closing in on the lead group now. The gap is just 11 seconds. Navarrete's win at that last intermediate sprint bolsters his lead in that classification, which sees him in the yellow jersey today. And now the two groups have merged, making it 15 riders in the break. Some reports have placed Rasmus Tiller (Dimension Data) up there, but I haven't spotted him. The Argentina national team and Municipalidad de Rawson Somos Todos both have three men up front, while Beltrami Tsa - Hopplà - Petroli Firenze are represented by two riders. In the meantime, the gap to the peloton has gone out to 7:30. We're now around 15km from the first classified climb of the day. The peloton is lined out on the long, straight road north. Asociacion Civil Mardan are once again prominent at the front. They Argentinean team don't have anybody in the break and are riding for team leader Laureano Rosas, who won this race three times in a row from 2014 to 2016. He lies eighth overall, 40 seconds down on Julian Alaphilippe. The peloton is lined out on a long, straight road heading south. The gap is creeping up to almost eight minutes. Álvaro Hodeg (Deceuninck-Quick Step) rides through the shot. The left side of his shorts are ripped away, exposing his upper thigh, while his jersey shoulder is ripped too. Hodeg is at the front of the peloton right now, so can't be suffering too much. He'll be able to rest up a bit later on anyway, as the climbers battle it out on Alto Colorado. It's only a third category climb, so just three, two and one points on offer. 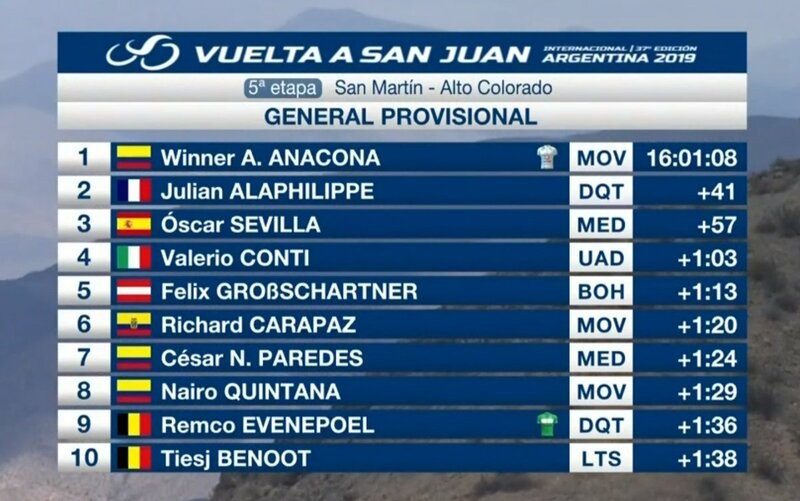 Facundo Cattapán is the only man with mountain classification points in the break. He only has two points, so can't challenge classification leader Daniel Zamora's 30-point haul. Iginio Lucero (Municipalidad de Rawson Somos Todos) has attacked the break, and built up a sizeable gap very quickly. We're still a very long way from the finish, and he has two teammates in the break, so it's not clear what the plan is. Unless he's just really keen for some mountain points, that is. Lucero duly takes the maximum three points at the top. Cattapán and Richeze lead the remainder of the break over the top to scoop up the other points on offer. They're around 20 seconds behind Lucero. We're 8km from the feed zone now, and 23km from the second intermediate sprint of the day. A bit of a lull, then, before the riders start heading uphill again. As we reach the final 100km of the stage and with the situation remaining stable, it's as good a time as any to take a look at the updates on the Deceuninck-Quick Step 'affair'. The past day has seen team sponsors Deceuninck and Specialized voice concerns over how the team has handled the fallout from Iljo Keisse's gesture. New lead sponsor Deceuninck has requested talks with the team leadership, while the American bike brand has been working with the team to ensure they "take full responsibility for their actions." The team has issued an apology via press release, in which they pledged to implement "specific conduct training protocols for all riders and staff." The team has been in better shape on the sporting side of things, though. Julian Alaphilippe is in prime position to take overall victory after winning two of the four stages so far, while 19-year-old neo-pro Remco Evenepoel took an impressive third place in the stage three time trial. We're 8km away from the second, and final, intermediate sprint of the day. The gap is down to just over seven minutes. The upcoming sprint is at Talacasto, 956 metres above sea level. In 84km the riders will be at the top of the Alto Colorado, at a massive 2624m. That's as high as the Gavia Pass, often the Cima Coppi in the Giro d'Italia – the race's highest point. Navarrete won the hotly-contested sprint. He takes another three points after pipping Tivani to the line. Soto took third. Some stats on today's final climb, the Alto Colorado, via Veloviewer. It's a long one at 19km long, but the average gradient is a gentle 4%. There are some sections of 8% though, which sound like a better place to launch an attack. Poor old Álvaro Hodeg is still working at the front of the peloton. He's the sole Deceuninck-Quick Step representative among the massed ranks of the orange-clad Asociacion Civil Mardan team. We're just 7km away from the top of the next climb. It's the second category Banos de Talasto, which averages a 3% gradient. Cattapán is on the attack. He took second at the first climb of the day. Cattapán takes the points at the top. His teammate Lucero takes second around 10-15 seconds later, ahead of the remainder of the break. Cattapán is still powering along on his own. He can't be thinking of the stage victory here, cna he? He's seven minutes up on the peloton and has 66km left to race. More likely, he's going for the next climb, the Alto de la Crucelita. The summit of the second category climb comes with 47km to go. Still some way away from where he is at the moment, though. After the next climb there's a short descent before the road starts ramping up to the lower slopes of the Alto Colorado. Cattapán is hunched over his Cervélo S5, moving into the drops then back onto the hoods. He's not entirely comfortable, and that's because of the big effort he's having to put in to maintain his advantage out there on his own. QuickStep now lend a hand at the front of the peloton. They have the race leader in Alaphilippe. With 55km remaining, the gap to Cattapán stands at 7:40. Movistar also start to contribute to the chase. Don't forget, they have Nairo Quintana here. Richard Carapaz, also. Quintana is 11th overall, 48 seconds down on Alaphilippe, while Carapaz is 17th at 1:04. Both seem too far away from Alaphilippe to entertain serious hopes of overall victory but a stage win - Movistar's first of the season - would be very handy indeed. The gap is falling as Cattapán takes on the next climb. It's really only a gentle one. The flat roads have morphed into false flat and now into something a bit more draggy, but it's far from out-of-the-saddle stuff. Cattapán's advantage over the peloton has been cut to 6:15. We don't currently have a time check to the 12 remaining members of the original breakaway, who are still somewhere in between. Cattapán crests the Alto de la Crucelita alone at the head of the race. Now we have a reliable time check, and the 12 other breakaway riders follow at 43 seconds. Our leader takes on a fast downhill section. There's a brief interruption but the road then tips downhill again before the final climb. Our top story today concerns San Juan, but once again it's the off-the-bike matters. You're all no doubt aware of the controversy surrounding Iljo Keisse and the Deceuninck-QuickStep team at the moment. Well, Specialized, the bicycle manufacturing giant that has sponsored QuickStep since 2012, has spoken out. Read its stance at the link below. Cattapán, meanwhile, is losing ground and it looks like he'll soon be caught back by the break. Cattapán is welcomed back into the fold and heads straight to the back of the group. We now have a lead group of 13 with a lead of 4:10 over the peloton. Several small groups on the road here. There's a regrouping at the front of the peloton but still lots of panicked riders sprinting to get back into contention. Lotto Soudal, QuickStep, and Movistar combine at the head of the peloton. None of the big names have been caught out here. The Neri-Sottoli team are leading the second peloton. The two pelotons stitch back together. Panic over, though the speed is still high. 30km remaining and the gap between the 13 leaders and the peloton is down to just over three minutes. After his earlier efforts, Cattapán has been dropped from the break and is now sitting up waiting for the peloton. Over in Spain, Emmanuel Buchmann has won the Trofeo Andratx-Lloseta on the second day of the Challenge Mallorca. You can find our report page here. 25km to go. After that frantic period in the wind, the peloton has eased off slightly and riders are taking on final bits of sustenance ahead of the climb to the Alto Colorado. The gap still stands at 3:05, which is more than manageable. Movistar are in control of the peloton as the pace picks up again. We're just a few kilometres from the start of the climb. Final, final call for Stephen Farrand's big stage preview. The final 15km, by the way, have an average gradient of 4.4%, though there are steeper sections towards the top. If anything, the altitude is more of a concern, with the summit at 2565m. The break has split ahead of the final climb. Montoya, Garibay, and Tivani are away. Peter Sagan is out the back of the peloton. Meanwhile, Winner Anacona (Movistar) launches the first attack of the day. César Paredes (Medellin) has made it onto Anacona's wheel. The two Colombians have separated themselves from the peloton now. Meanwhile, Deceuninck-Quick Step have responded by massing at the front of the peloton. Vakoč and Evenepoel are leading race leader Alaphilippe. Anacona and Paredes are sweeping up the remains of the day's break now. Tivani has managed to hang onto the wheel of the duo though. At such a high altitude it's no surprise that the Colombians are in their prime. Montoya is leading the remains of the break, while Anacona and Paredes are the two attackers. Another Medellin rider, Fabio Duarte, has joined in the fun too. He has attacked the peloton. Not sure what the team are going for with these tactics considering they have two men up the road, to be honest. Several more riders clip off the front. Montoya is alone up front now. He's 40 seconds up on the Anacona group, and over a minute up on the peloton. Garibay is with the Anacona and Paredes group now, having fallen back from Montoya. They're 30 seconds behind the lone leader. Remco Evenepoel is leading the peloton for Alaphilippe now. A great effort from the 19-year-old just one month into his pro career. Anacona and Paredes have shed Garibay now. They're 15 seconds behind Paredes and around a minute ahead of the peloton. Sevilla and Carapaz are midway between the break and the peloton. Garibay is also there, along with his Mexican teammate Efrén Santos. Two groups of three on the attack now, as Garibay drops back having done the last bit of work possible on behalf of Santos. It's now Evenepoel and Alaphilippe vs the two attacking trios. The virtual podium right now is Anacona, Sevilla and Carapaz, with Alaphilippe in fourth as things stand. The peloton isn't making any time up, either. They're consistently around 1:20 behind the leaders. Nairo Quintana (Movistar) is immediately on his wheel. Nairo's brother Dayer (Neri Sottoli - Selle Italia - KTM) joins in the fun too, making another trio on the attack. The trio are quickly brought back by the peloton, however. Dayer Quintana goes again! Alaphilippe and Nairo are with him. Final kilometre now for the leaders. Anacona is riding to the lead, but Medellin will have their eyes on the stage win. More attacks from the peloton, which has shattered at this point. The two men from Medellin are on Anacona's wheel as they head to the finish. Into the final 500 metres now. It's a brutal crosswind up there. And the sprint begins! Anacona leads out and overpowers the two Medellin riders. Winner Anacona (Movistar) wins stage 5 of the Vuelta a San Juan! The remains of the peloton come in at over a minute down, meaning that Anacona is the new overall leader too. Here's the Colombia-dominated top ten on the stage. And here's the new GC. Alaphilippe saves his podium spot, at least. It's Winner Anacona's first victory since 2014, when he won stage 9 of the Vuelta a España, the summit finish of Aramón Valdelinares, from the early break. It's a shame for Medellin, who were super-aggressive on the climb with four of their six riders on the attack at various points. They can console themselves with Óscar Sevilla's new position on GC though – he's third overall, six seconds ahead of Valerio Conti. Tomorrow's stage 6 will be the final realistic chance to affect the general classification. The stage is largely flat but gets lumpy at the end, with a small climb and an uphill finish. With large time gaps between the top three men, look out for Conti to try and move up onto the podium. With Anacona's win, Movistar becomes the eighth WorldTour team to get off the mark in 2019. Of course, Deceuninck-Quick Step lead the way with four, while UAE Team Emirates and Mitchelton-Scott have three apiece. Finally, here's a roundup of the various classification leaders as they're presented on the podium. Winner Anacona (Movistar) is in the white GC leader's jersey, with a 41-second advantage over Julian Alaphilippe. Daniel Zamora (Agrupacion Virgen de Fatima) has secured the orange mountains jersey, with his 30 points now insurmountable with no classified climbs left. Remco Evenepoel (Deceuninck-Quick Step) is in green of the best U23 rider with a two-second advantage over Gino Mäder. Maximiliano Navarrete (Argentina) is in the yellow of the intermediate sprints leader, with 11 points to Gerardo Tivani's 5. And finally, Daniel Zamora (Agrupacion Virgen de Fatima) is the top local rider as well as top Argentine rider. That's all from us today. Be sure to tune in at the weekend for the final stages of the Vuelta a San Juan 2019.